The Camaro first appeared in the 2007 Transformers movie, when the car was still in concept form. Sports-car fans who fantasize about being an Autobot can now make their dual fantasy a reality -- with the 2010 Chevrolet Camaro Transformers special edition. General Motors announced the package today in San Diego. Its available for order now through dealerships. The Camaro has been a rare bright spot in U.S. sales for GM, which emerged from 39 days of Chapter 11 bankruptcy on July 10. In June, the Camaro beat Ford Motor Co.'s restyled Mustang, 9,320 to 7,362. It was the Camaro's first victory over the Mustang since November 1993. GM said it had a six-day supply of Camaros at the end of June. The Camaro appeared in the 2007 Transformers movie, when the car was still in concept form, and returned for an encore performance in this summers flick. The Bumblebee Camaro also was shown at the Chicago auto show. 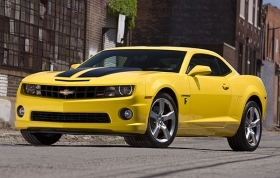 When the first Transformers movie was setting box-office records, we had countless customers asking to purchase the Bumblebee Camaro, Karen Rafferty, Chevrolet product marketing director, said in a statement.